1. 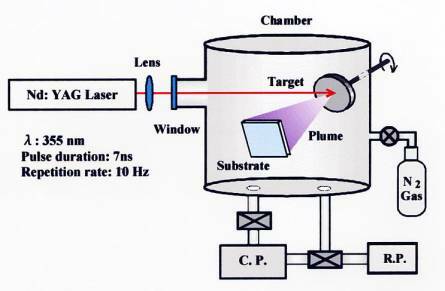 A. Marcu, C. Grigoriu, W. Jiang, and K. Yatsui,“Pulsed laser deposition of YBCO thin films in a shadow mask configuration”, Thin Solid Films 360, 166〜172 (2000). 2. 平井 誠、鈴木常生、江 偉華、Constantin Grigoriu、八井 浄, ｢パルスレーザーアブレーション法で作製した AlN 薄膜の特性｣, 電気学会論文誌 120-A, 110〜115 (2000). 3. K. Yatsui, T. Yukawa, C. Grigoriu, M. Hirai and W. Jiang,“Synthesis of ultrafine γ–Al2O3 powders by pulsed laser ablation”, Jounal of Nanoparticle Reserch 2, 75〜83 (2000). 4. C. Grigoriu, T. Yukawa, M. Hirai, K. Nishiura, W. Jiang and K. Yatsui,“Synthesis of Nanosized Aluminum Nitride Powders by Pulsed Laser Ablation”, J. Am. Ceram. Soc. 83, 2631〜2633 (2000). 5. M. Hirai, Y. Ueno, T. Suzuki, W. Jiang, C. Grigoriu and K. Yatsui,“Characteristics of CrN Films Prepared by Pulsed Laser Deposition”, Jpn. J. Appl. Phys. 40, 1052〜1055 (2001). 6. M. Hirai, Y. Ueno, T. Suzuki, W. Jiang, C. Grigoriu and K. Yatsui,“Characteristics of (Cr1-x, Alx) N Films Prepared by Pulsed Laser Deposition”, Jpn. J. Appl. Phys. 40, 1056〜1060 (2001). 7. T. Suzuki, H. Saito, M. Hirai, H. Suematsu, W. Jiang and K. Yatsui,“Preparation of Cr (Nx, Oy) Thin Films by Pulsed Laser Deposition”, Thin Solid Films 407, 118〜121 (2002). 8. M. Hirai, H. Saito, T. Suzuki, H. Suematsu, W. Jiang and K. Yatsui,“Oxidation Behavior of Cr-Al-N-O Thin Films Prepared by Pulsed Laser Deposition”, Thin Solid Films 407, 122〜125 (2002).